How to make marinara sauce with just a few simple ingredients. Store up to a week in the refrigerator and up to 6 months in the freezer. 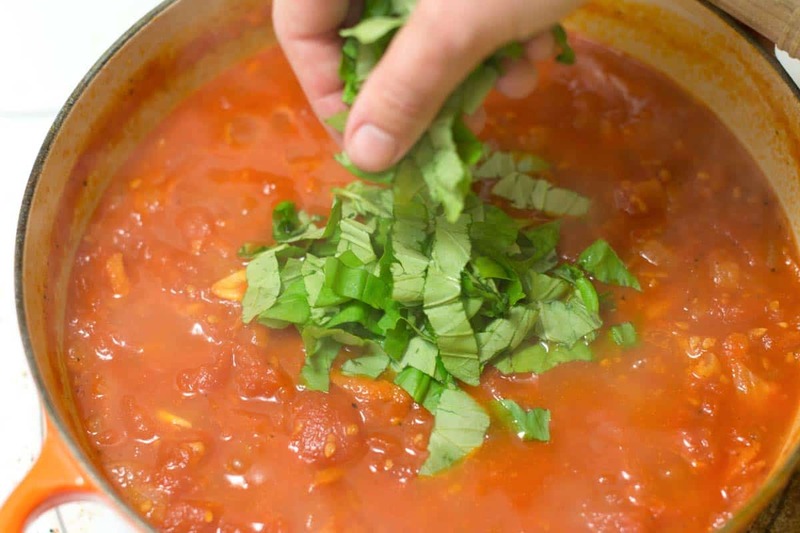 Jump to the Homemade Marinara Sauce Recipe or read on to see our tips for making it. We eat a lot of pasta around here, and while we always stock up on boxes of pasta, we usually forget the jars of pasta sauce. Night after night of disappointment led to learning how to make homemade marinara sauce. We’re so glad we did. Our marinara sauce recipe is surprisingly easy to make and can be stored up to a week in the refrigerator and up to 6 months in the freezer. 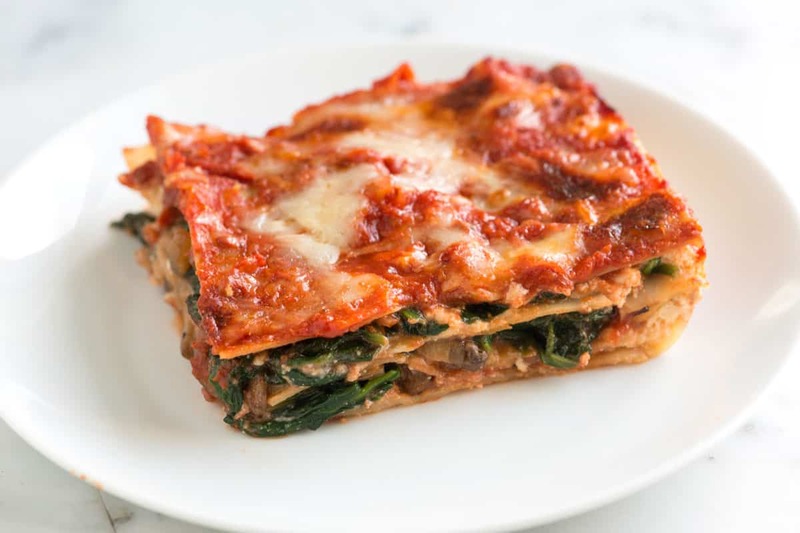 We use our marinara sauce to make this Spinach Lasagna Recipe with no-boil noodles layered between fresh spinach and cheeses. It’s delicious. Use this basic marinara sauce as a building block for many dishes. 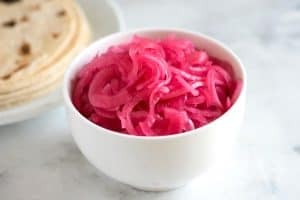 Toss with pasta or add to fish and meat dishes. To make it creamy, stir in heavy cream. For a spicy version, add extra crushed red pepper flakes. Or for a briny version, add olives or capers. 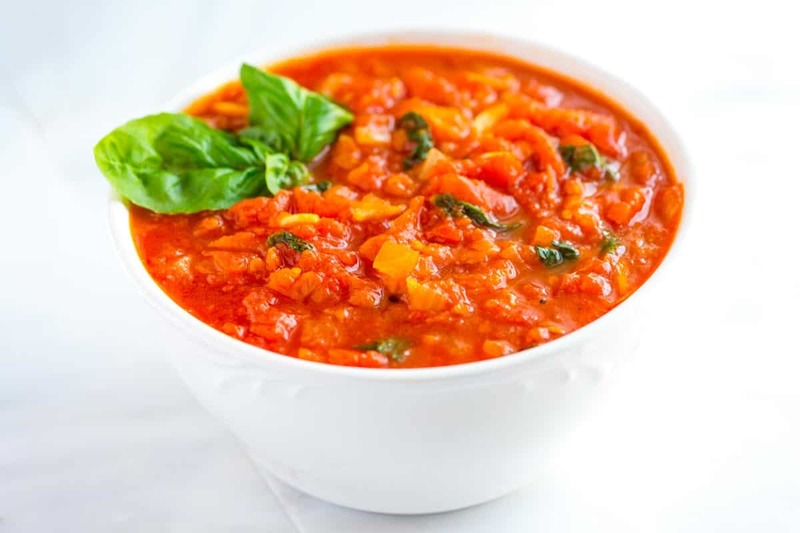 Tomatoes — you can use canned whole tomatoes or fresh tomatoes. Olive oil adds richness to the sauce. Garlic adds flavor and spice. 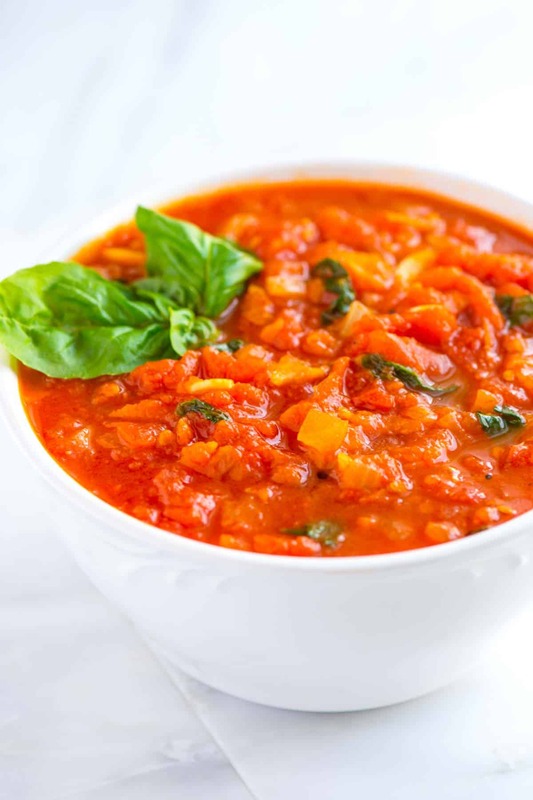 Onion and carrots add sweetness, which balances the acidity of the tomatoes. Fresh herbs, especially basil keeps the sauce tasting fresh and light. For the carrots, we took a tip from Mario Batali — he gates the carrot. We loved that — the carrot sort of melts into the sauce. You almost don’t know it’s there. If you are using canned tomatoes, use canned whole tomatoes. They are much better suited for the sauce than diced. We also love to hand-crush the tomatoes. This way, we can control the texture of the sauce. If you prefer, you can use a potato masher or a pair of kitchen shears to break up the whole tomatoes. To make the sauce, cook the onions, garlic, and carrots until soft and sweet. Add the tomatoes and let the sauce simmer until reduced. Easy! This baked spaghetti comes together quickly and takes full advantage of fresh, homemade marinara sauce. 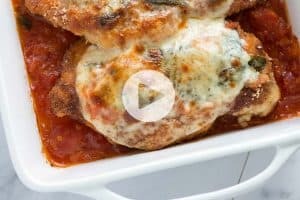 We cook turkey meatballs in a similar sauce made with tomatoes, basil, and garlic. Our baked ziti with spinach is fast and easy to make. Thank you for sharing this recipe. I had to used this as a base but unfortunately had to do modifications. I used a can of crushed tomatoes and all my spices were dry. But it is so dang good! We will be making again and again! Hi Sharon, We call for two 28-ounce sized cans of tomatoes — or two large cans of tomatoes. Fresh tomatoes are the best we always use (Romas) for their flavor & fewer seed which we crush to our desired consistantcy. Season w/onion, garlic. Carrot, Italian seasoning, parsley, Basil, garlic salt, cup of white wine or if you prefer burgundy is good too. Simmer for 2 hrs. This is my first time making Marinara sauce and Spinach Lasagna. Both are easy and delicious. Next time I make it, I will double the fresh basil in the sauce and add a little more mozzarella in the lasagna. Thanks for a great recipe! What are a few of the best brand of canned tomatoes? We really love Muir Glen (Organic version) as well as San Marzano tomatoes (we buy the Cento brand often). 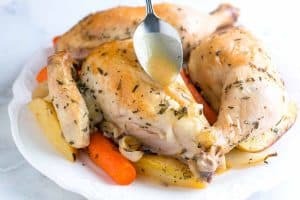 I’m new at following recipes and my mom-in-law has been great with helping me but you need to tell us newbies when to either simmer uncovered or covered! I tried this tonight and I let it simmer semi/uncovered and found the sauce to be flavourful but watery! Is that how it was suppose to turn out? Hi Mary, We simmer the sauce uncovered, which will help it reduce slightly and become extra flavorful. How can I incorporate fresh tomatoes? I have a lot of fresh produce and would rather not use canned. Hi Carrie, We use fresh tomatoes often. Cut a little “X” into the bottom of each tomato then plunge them into boiling water for about 10 seconds. After that, add them to icy water to cool them down. 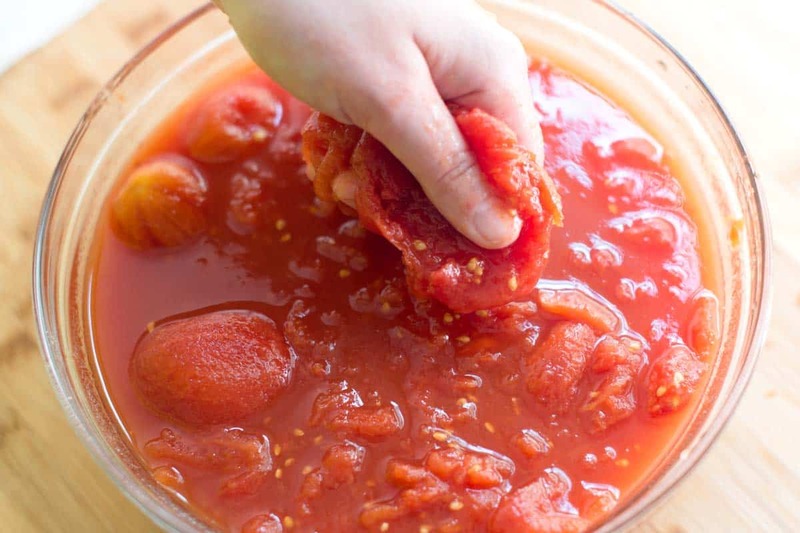 This process makes the skins of the tomato peel off easily. Peel the tomatoes then chop. From there, follow our recipe as directed, but replace your chopped tomatoes for the canned. 2 pounds of fresh tomatoes should be equivalent to 1 28-ounce can. So, to make the whole recipe, use around 4 pounds. (Don’t worry if the measurement is a bit off, the sauce will still be great). Hope that helps! I was wondering if I could add some ground cannelloni beans to the sauce? Sure! By doing so the marinara will be a little creamy. 1. Do you think I could use fresh garden tomatoes? 2. Do you think I could can this instead of freeze? Yes, garden tomatoes work great — we recommend peeling them first. To do this, cut an “X” in the bottom of each tomato then add to boiling water for about 1 minutes. Then plunge into icy water. The peel should come off easily. As for canning — You can instead of freezing. Great recipe. I plan to ‘Indianize’ it (Indo-Canadian Spice Girl) by adding homemade garam masala (thanks Mom!) w/ the onions and reducing the amount of carrots. We are in the exact situation forget the sauce from store 🙂 and now trying on our own.. great recipe ..Thanks. Making your own marinara sauce is so easy and always good!